I love Starbucks’ Pumpkin Scones. Especially with their Pumpkin Spice Latte… Bliss!! I attempted a pumpkin scone the other day… Blech. It was ok, but not what I was hoping for. 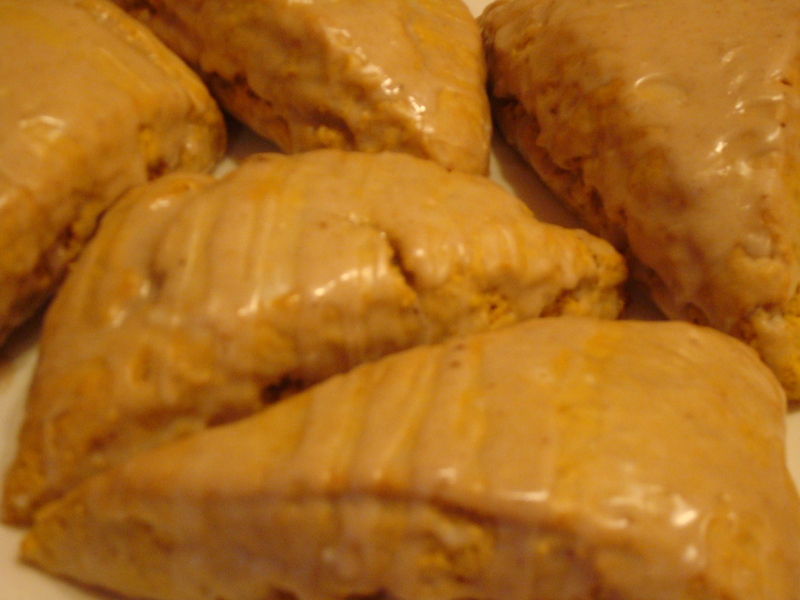 Then I ran across this blog that had a recipe for Starbucks Pumpkin Scones. I had to try it! Especially because I opened up the big can of Libby’s Pumpkin the other day when I only needed a 1/4 cup of pumpkin. Poor Mister has had to endure me making tons of stuff to use up the rest of the pumpkin: a so-so batch of scones, pumpkin chocolate chip cookies, and now a new batch of scones. He’s surviving the torture of baked goodies. The recipe may seem long, but it is SUPER EASY to make! The only difficulty I had was waiting for the scones to cool!! They turned out EXCELLENT!! Definitely like Starbucks. Now, I may have to try this recipe to make my own Pumpkin Spice Latte tomorrow… Mmmmmm!! Chef’s Notes: I have this ‘thing’ about doubling the spice in pumpkin recipes. I just love my pumpkin extra spicy. In this case the ONLY thing I doubled was the cinnamon in the scones. Nothing else! Also, random complaint: the 7 tablespoons of sugar annoys me. Seriously, 4 tablespoons equal a 1/4 cup and 8 tablespoons equal a 1/2 cup. They had to make the sugar in this recipe be 1 tablespoon short of a 1/2 cup?? Ok, Ok, I understand baking is a science and all that stuff. Sigh…random complaint over. 4. With a fork, pastry knife, or food processor, cut butter into the dry ingredients until mixture is crumbly and no chunks of butter remain. Set aside. (Note: I have a $250 Kitchen-Aid Mixer FOR A REASON… To do the WORK! I don’t use anything but my mixer for cutting in butter, as it does a perfectly good job. Just let it mix for several minutes and you’ll have a nice crumbly mixture without killing your arms or pulling out the food processer). Who got that wild hair?! Way YUM!!!!! Made for a great desert tonight! Well, since you seem to lose weight by simply *thinking* about it, prepare to eat all the rest of them… As well as the Pumpkin-Chocolate Chip cookies. Sigh…. Or you could freeze them for say a month or so? yum…I’m going to be making these on my next day off work…I love pumpkin anything and these sound delish!! I saw the picture of pumpkin butter on your blog, and that reminded me that I need to use the rest of the pumpkin I have for that!